During the February 1 City Council meeting, we’ll be hosting a viewing party at Workantile, the Main St. coworking space. Join us! City council meetings start at 7pm, so we'll gather at Workantile a few minutes before then. We'll have a video feed of the meeting running on a big TV, and many of the #A2Council Twitter folk plus our friends will be there for real-time commentary and socializing. Whether you're heavily invested in local politics or just curious, this should be a fun and useful event. All are welcome. Updated Jan. 26: Some snacks for the party will be provided by CivCity, a great local nonprofit dedicated to expanding residents’ knowledge of how local government works and increasing participation in civic life. Thanks, CivCity! Please bring your own drinks, if you're so inclined. Workantile's address is 118 S. Main St.
Facebook event: A2 City Council Viewing Party. Gentle readers, the first Nerd Nite of January is here. Presentations will cover everything from anxiety to agriculture and back again. 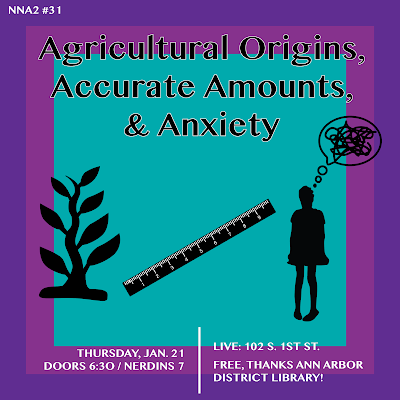 Cover is free, thanks to the AADL so you really have no excuse not to attend.